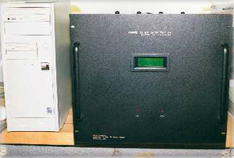 The Q-4X4 is 1KW matrix switch used for pre-operational transmitter and antenna setup. Controlled by a PC, its software makes certain that no faulty connections and no live power can be switched. 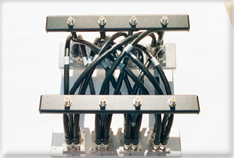 The RF cables were manufactured by Times Microwave, the RF switches were manufactured by Dowkey Microwave, and we designed and fabricated the control circuit and packaging. We were able to deliver this unit within six months after receiving order. It's performance had exceeded our expectations: very low loss and VSWR throughout the RF cables and the RF switches.